Late for the show, Doug (Joe Piscopo) and Wendy (Robin Duke) complain to an NBC page (Julia Louis-Dreyfus). This was a little better than usual for a Whiners sketch; most of these are pretty much the same thing, but there were a few smaller details that bumped this up: their hope that Gilda Radner is on tonight's show (a dig at those who miss the old cast, perhaps? ), and Duke's cadence on "they're so loud/they're so young/she's so loud". The part where the Whiners complain about the size of Julia Louis-Dreyfus' character's head ("Your head is very large") always reminded me of the episode of Seinfeld where Elaine's blind date breaks up with her by telling her she has a big head. This is the last time the "Live from New York..." opening is used this season. 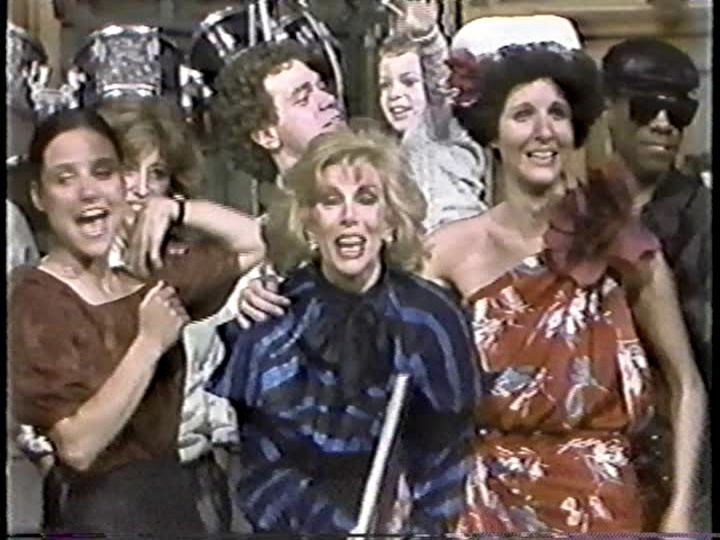 Joan Rivers does stand-up on Beverly Hills vs. New York and her unhappy childhood. Very energetic monologue, and Rivers seems to feed off the energy of a very hot audience tonight. Towards the end she starts laughing through some of the jokes, but Rivers was in her wheelhouse here. Best jokes: afterbirth twins, wet floor. David Susskind interviews Buckwheat's bodyguard Burger Johnson (Eddie Murphy), author of a new tell-all about his late employer. 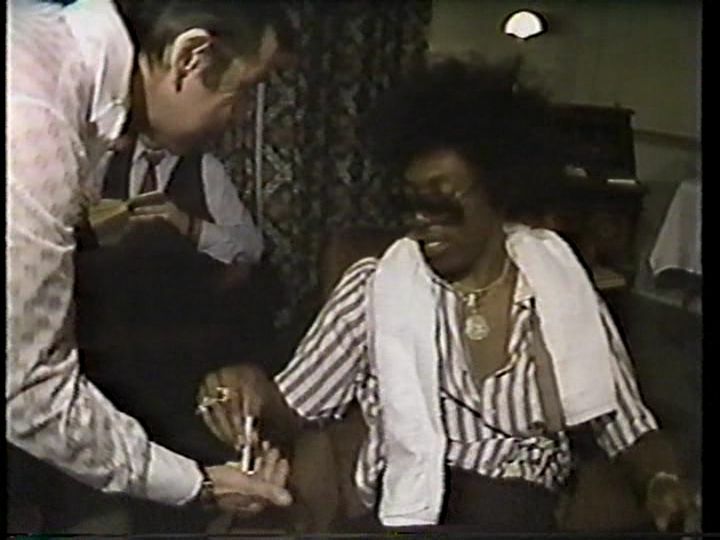 Backstage footage confirms "Buckwheat (Eddie Murphy) Was A Sleazeball". The lesser-known third part of the Buckwheat Dead saga, with a cameo from the real Susskind and Eddie Murphy carrying both the live and pre-tape sections. By this point Buckwheat has become a vehicle to satirize other things, notably posthumous interest/cash-ins on dead celebrities and tell-all books. 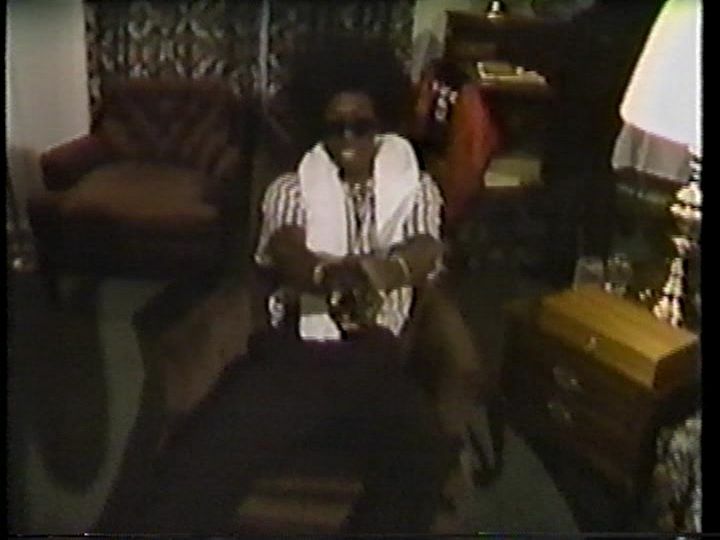 The pre-tape (directed by Claude Kerven), which features Buckwheat being abusive to his entourage and ends with him about to begin a three-way with two women (or "a Buh-weet sammich"), is more about Murphy's performance (including the Buckwheatized dialogue) than any hard jokes, but it works here. Clint Smith appears as the entourage member that Buckwheat makes kiss his ring before calling him a leech. Stories about Bing Crosby's kids, Gloria Swanson, and Buckwheat in this week's issue of the tabloid. Very well done, with a lot of rapid-fire jokes (I love the "Lorne Greene BO" graphics). 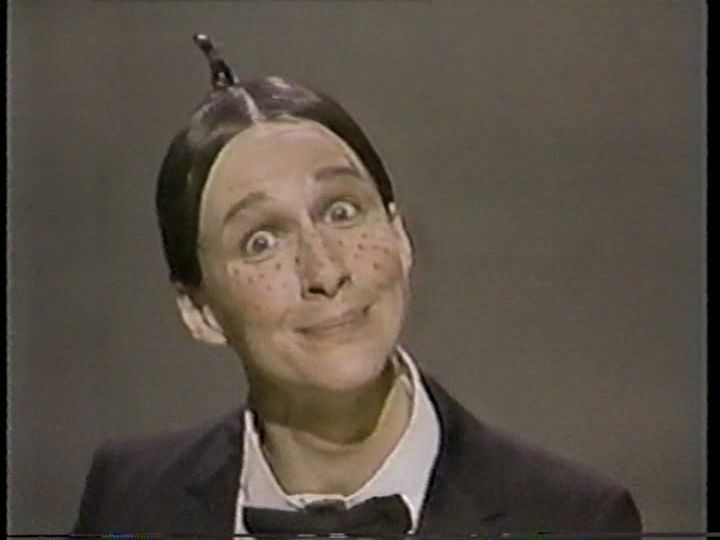 Ends with Mary Gross bringing back Alfalfa ("For people with inquiring minds...like me!"). 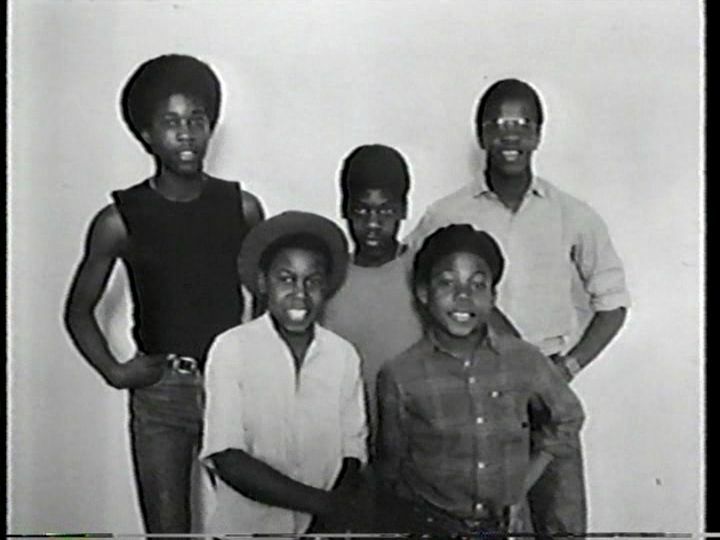 Three performers (Eddie Murphy, Tim Kazurinsky and Gary Kroeger) who make their living as Buckwheat impersonators. This didn't feel as well-developed as the other part, but there were still some good moments, particularly Gary Kroeger's "Who died and made you Buckwheat?". Eddie Murphy comes back as a different character here with an interesting vocal inflection. 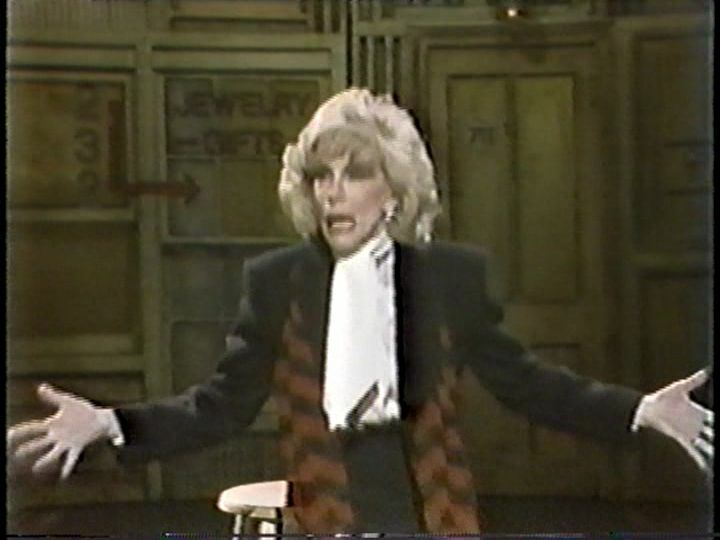 Joan Rivers (Joe Piscopo) and Joan Rivers duel with one-liners. This was a lot of fun, and both Piscopo and Rivers seem to be enjoying themselves here, ad-libbing and laughing at some of each others' one-liners. Piscopo looks positively huge next to Rivers (at one point Rivers calls him "Joan Rivers on steroids") and plays a little too big, but he has the accent down. The ending where Rivers' husband Edgar (with a bag over his head...was that the real Edgar Rosenberg?) chooses the "real Joan" by touch (including feeling chests) felt a little obvious, though. Backstage, Academy Awards compare rank by category. A little too cute an idea for my tastes, but this had its moments; particularly Eddie Murphy's performance as the Best Actress award, boasting about the possibility of going home with either Jessica Lange or Meryl Streep that night and being with Katherine Hepburn three times. This goes by quickly. During the transition to the next scene, Eddie Murphy can still be heard from the other stage mocking Brad Hall's Oscar (purportedly "Best Picture", actually a lifetime achievement award for working with dogs and monkeys); Gary Kroeger also falls over. Elizabeth Taylor (Joan Rivers) reminisces about National Velvet. Basically a sketch version of Rivers' constant jokes about Taylor's size; not really a whole lot to it aside from some fat jokes, though Rivers starts laughing partway through. Very few jokes in this one, aside from a lengthy crawl about co-operative events the Chinese will boycott in response to Ronald Reagan granting asylum to tennis player Hu Na. Most of these are fairly weak bordering on cringeworthy, but there's a funny moment where Brad Hall gestures to the crew to speed up the crawl during his speech he reads while it runs. Of the other jokes, there's not much to talk about, but one refers to the Today Sponge's approval by the FDA (Seinfeld notably did an episode where Elaine hoarded the contraceptives after they were taken off the American market in the mid-90's). Mary Gross returns, in a lather over the Oscar nominees. This was a little weaker than normal; the ongoing thing about the movies either being about transvestites or drunks didn't work as well as expected, although Gross' line about Meryl Streep really being Wayne Gretzky in drag in Sophie's Choice made me laugh. 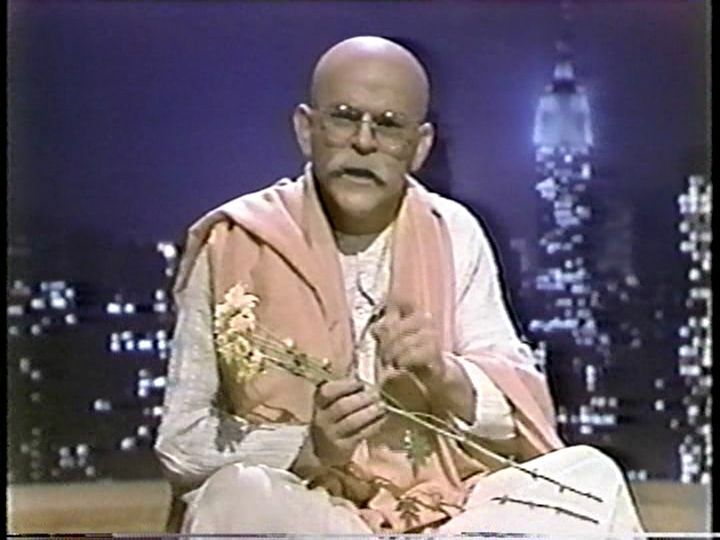 Havnagootiim Vishnuuerheer (Tim Kazurinsky) is back to discuss things that make him angry, which turns into another Unanswered Questions routine. Like Gross' commentary, this was not quite as good as the previous outings, with a little more reliance on wordplay than usual tonight. SNN's favorite punching bag, Secretary of the Interior James Watt (Joe Piscopo), appears to boos and hisses from the audience before talking about his favorite music (the sound of a tree falling and the club hitting a baby seal) and how he had his head "cleared" before launching into a rendition of "Barbara Ann" with Hall and Gary Kroeger (who randomly pops up from under the desk). This was the week the real Watt banned rock groups (particularly The Beach Boys and The Grass Roots) from performing the Independence Day concert on the Washington Mall because they attracted the "wrong element". More a chance to attack the perpetually awful Watt than anything particularly funny, but the guys do a decent job with the song (Piscopo handles the falsetto). 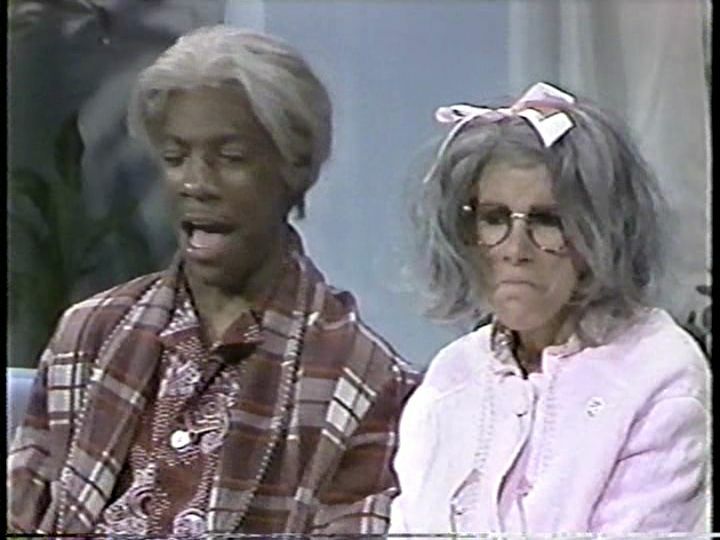 In 2040, an elderly Joan Rivers and Eddie Murphy reminisce about the height of their popularity. This is basically another chance for Joan Rivers to do her thing, but like with Dueling Joans, this was a lot of fun, with some self-deprecation and fourth wall-breaking from both Rivers and Murphy (who plays his older self as an alte kaker, complete with Yiddish accent). I was amazed censor Bill Clotworthy let them get away with the "Edgar's not coming" "Tell me something new!" exchange. 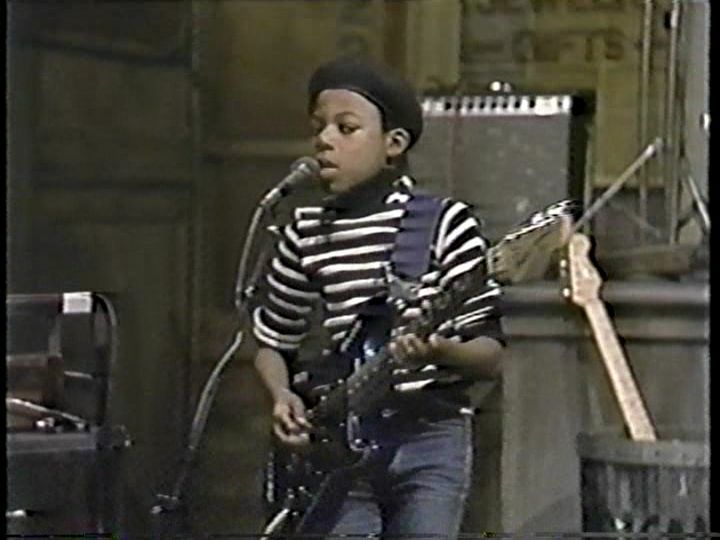 MUSICAL PERFORMANCE: "PASS THE DUTCHIE"
Between Musical Youth and Drew Barrymore, SNL was booking a lot of children on the show this year. Even though this wasn't particularly great (Kelvin Grant's vocals seem too mumbly and tired), I have to give the band some credit for playing the song live without any extra backing musicians. 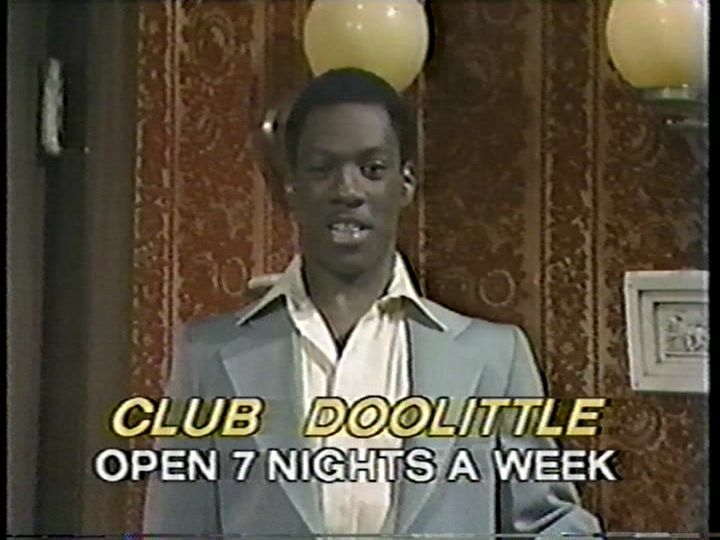 E. Eppy Doolittle (Eddie Murphy) woodenly advertises his nightclub as his customer (Joe Piscopo) throws food at him. This is more notable for being one of the great examples of character-breaking on SNL than anything else: what starts as a spoof of wooden late night ad acting descends into chaos as soon as Murphy visits the side room where Piscopo is on a bed with two girls; Piscopo starts to smear whipped cream onto Murphy's face, who starts having trouble getting through his lines without laughing. Then, Piscopo starts throwing food at him from off-camera, which eventually causes Murphy to throw it back and yell "THIS IS LIVE TELEVISION!" Aside from that, my favorite part was Robin Duke's silent appearance as the boozy keyboard player, particularly when Murphy points at the camera, and she feebly points a beat later. A second Clint Smith appearance, this time as E. Clinton Smith, the chef at Club Doolittle. Writers Andrew Kurtzman and Margaret Oberman also appear in a still photo as the couple at the ATM. Joan Rivers tells jokes about her teenage daughter Melissa's birth and ugly rock stars. Joan is energetic here, but it feels like it was put in as a time-filler when the previous sketch ran too long. 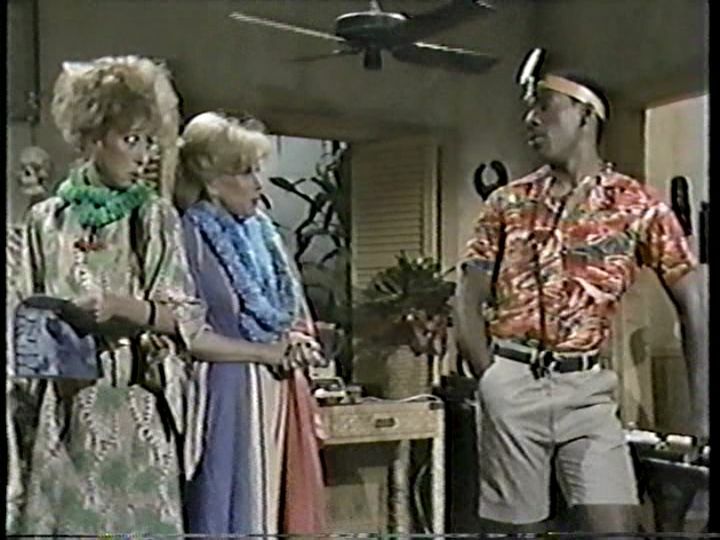 On the Island of St. Chuck's, a vacationing New Jerseyite (Joan Rivers) visits Dr. Bango Angora (Eddie Murphy). A lower-key sketch, and probably the best developed as a scene, even if it wasn't the funniest thing in tonight's show. Robin Duke, Joan Rivers and Eddie Murphy seem to scale back here, while Mary Gross gets a chance to chew scenery here as she sings "Carribean Gyno" to the tune of "We're Having A Heat Wave" (at one point, stretching the note past a single breath). MUSICAL PERFORMANCE: "NEVER GONNA GIVE YOU UP"
Again, nothing amazing, but a better performance than the first number. Joan Rivers hands out copies of her album What Becomes A Semi-Legend Most? 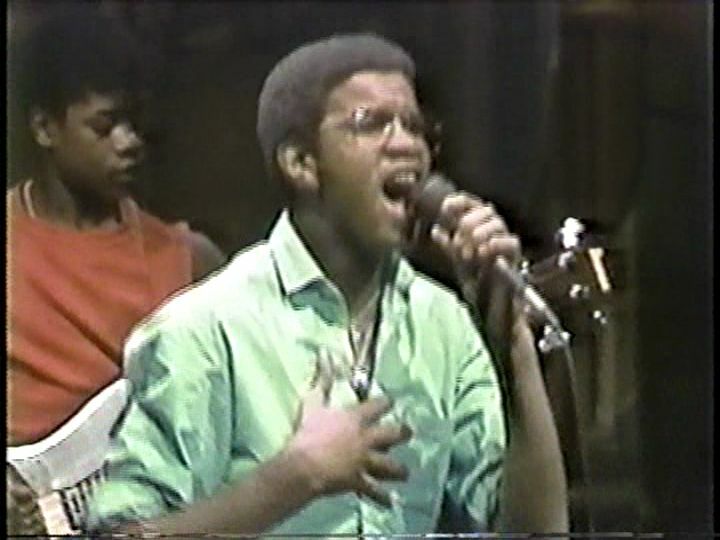 as Gary Kroeger praises Musical Youth's performance. The credits cut off early on the original broadcast, but Rivers gets a writing credit. 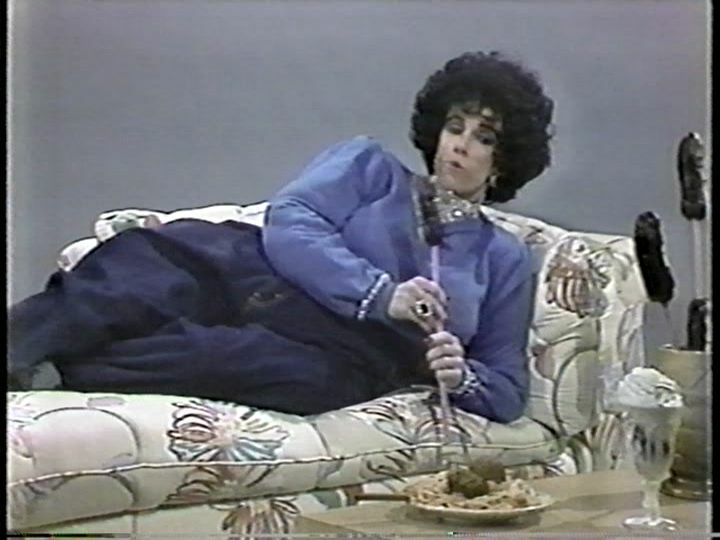 Like Lily Tomlin and Sid Caesar's shows, this was another week dominated by the host's sensibilities, but tonight's show also happens to be one of the most loose and fun episodes of the entire season (if not the entire Ebersol era), and goes by fairly quickly. It's not quite as representative of SNL as a whole, as balanced or as well-written as the first Hesseman show, but there's a lot to enjoy here, and aside from a worse than usual Saturday Night News, the weaker segments aren't too bad.